Eugenical sterilization is the removal of all reproductive abilities from an individual by treating the individual with chemicals or subjecting them to high heats or radiation. In being subjected to such methods, individuals were stripped of their right to reproduce in an attempt to limit the reproduction of the “unfit.” Unfit individuals were categorized based on their mental capacity, race, and overall genetic makeup. 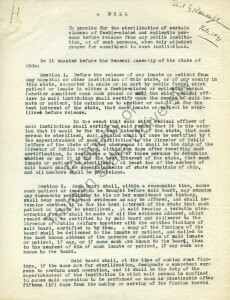 Harry Laughlin introduced this idea, and shortly thereafter created what he thought to be the model sterilization law. 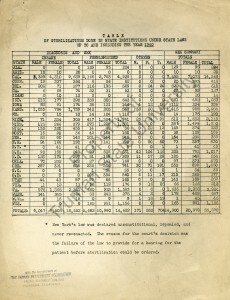 This idea of sterilization in an attempt to curb unfit reproduction carried weight not only in America but played a huge role in the eugenics movement as a whole. 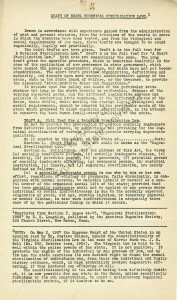 Although Harry Laughlin presented this idea in America, it would have a significant impact in other areas of the world. Specifically, the use of negative eugenics—defined as the attempt to reduce the reproduction of the unfit—was regarded as a legitimate method to limit the reproduction of unfit individuals.